Men! Look Your Best In 2017! We would be remiss to focus all of our attention on the common treatments that help women look and feel their best, but this seems to be the very nature of aesthetic medicine, doesn’t it? Well, we are going to turn to tables a bit. We know that it is just as important for a man to be able to openly invest in his appearance. Men struggle with many of the same concerns that women do as they age, such as looking less friendly or being passed over for jobs or promotions due to the perception of age. 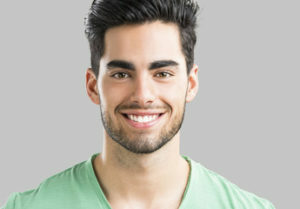 Regardless of reason – because any reason is a good reason to invest in yourself – there are certain procedures that are quite popular among our male patients. Is there anything more that can be said about the value of injectable solutions at this point? Since the dawn of the Botox era more than a decade ago, women have freely obtained this lunchtime treatment that reduces the signs of aging around the eyes and even on the neck. For men, Botox may be the optimal non-surgical treatment to restore a friendlier tone to the eyes, minimizing the frown lines that may have developed with age. With results that last 3 to 6 months and treatment that takes less than 30 minutes, there isn’t much regarding downside to Botox for wrinkle reduction, other than the need for maintenance. Like a lot of surgical procedures related to aesthetics, eyelid rejuvenation with blepharoplasty is something that is usually associated with women. Not so anymore! Men are realizing that the appearance of their eyes can have an enormous impact on their interactions with colleagues, clients, and with new acquaintances. Eyelids that are heavy, or lids that are sagging beneath the eyes, make a man appear tired, even if he is anything but. Blepharoplasty is a precision technique through which excess fat and superficial tissue are removed to reinstate the appearance that a man enjoyed years before surgery. It may sound interesting, but neck lift surgery is one of the most sought-after by male patients. The benefits of a more sculpted neck and chin are twofold. First, a man’s jaw line lends to his youthful masculinity. Second, excess skin and fat tissue around the neck can be downright uncomfortable, especially when wearing a short and tie. We love helping our patients feel the natural beauty they were born with. Sometimes, it just needs to be uncovered. Learn more about facial rejuvenation when you call Williamsburg Plastic Surgery at (757) 345-2275. Do You Know What To Expect After Liposuction?